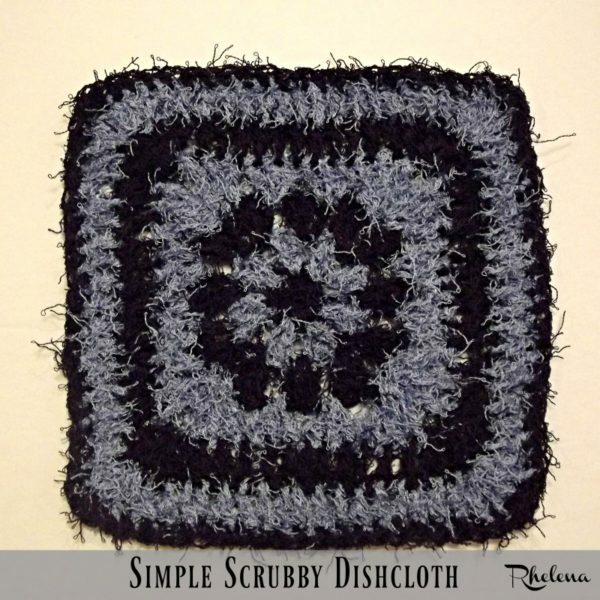 This scrubby dishcloth crochet pattern features a very simple stitch, which makes this a whiz to whip up. I used two colors for a delightful scrubber that you won’t want to hide when your guests arrive. Thank you so much to Red Heart for providing this yarn. Visit their website to shop or browse the colors available in the Scrubby yarn. I found this yarn so easy to fall in love with. Due to the nature of the yarn, it’s a bit more difficult to work with, but I love the final texture in the fabric. And I really love it for scrubbing dishes, pots and pans. The yarn is 100% polyester, which means it’s non-absorbent; so you can’t use it to wipe down the kitchen counters. However, it dries fast and is a must-have for the kitchen sink. This is my first time trying this yarn out, so am not sure on the durability, but it does look like it’s going to last a good long time. Although the yarn is perfect for dish scrubbers, I can also see this in pretty flower appliques, keychains and in other embellishments. Check out CPB for more Free Crochet Dishcloth Patterns. Thanks for the pattern! I’ll have to check out the yarn as I’m always looking for something other than cotton to crochet dish cloths and wash cloths with. It’s true that this kind of yarn is not easy to crochet, but you did a good job. I like the result very much.